The power of nature can be awe inspiring and humbling. You may have felt it in the aftermath of a bombogenesis or while viewing the solar eclipse. Inspired by these events, we have put together a list of some of the most beautiful, awesome, and fascinating wonders of nature for you to explore. 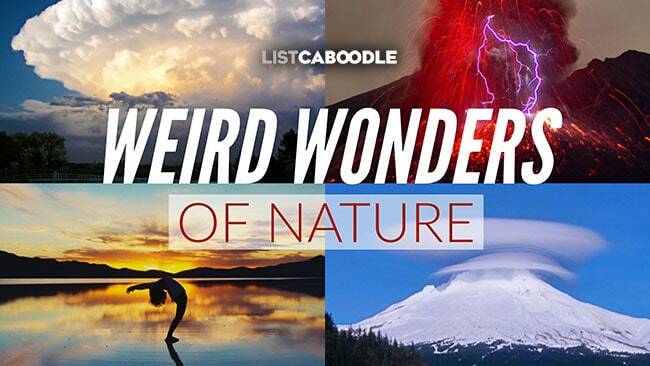 Check out these videos and be amazed at the power and spectacular beauty of nature! Look over by that mountain and you may see a strange, saucer-like shape in the sky. Lenticular cloud are named for their typical lens or saucer shape and appearance. But you won’t see them in low lying areas or plains. These particular clouds form above obstructions like tall buildings, bridges and mountains. The natural flow of wind and air is disrupted by the object and eddies are formed. Turbulence is created by the diverted air flow and eddies. Moisture in the air then condenses and lenticular clouds are formed. Learn more about weather maps. Sinkholes can appear suddenly and dramatically. Amazing footage shows them taking out sections of freeway, swallowing cars and even homes. But the formation of sinkholes takes place over a long period of time before anything is seen on the surface. Erosion from groundwater slowly weakens soluble bedrock and shifts or settles sandstone particles, creating a void when the water table is lowered. The surface above appears normal until—and sometimes quite suddenly—it collapses into the gaping sinkhole. Interested in exploring more wonders of nature and travel? Check out the top 10 frightening commutes. The supercell storm is the rarest and most severe of the thunderstorm classifications. This type of storm is formed when warm and cold fronts collide within a low pressure system. A mesocyclone, or rotational updraft, is formed. The result is the characteristicly towering and massive shelf cloud. Most notably, the supercell is distinguished from other storm cells by its large-scale rotation. When a tornado or funnel cloud is formed over water, it is called a water spout. Water spouts are often not as strong or as large as a tornado over land. They seem to be sucking up water as they go, but in fact most do not. Legend—or myth—has it that In ancient times sailors would shoot cannons through the spouts to kill them off. The bubbling lobes of mammatus clouds may lead you to think the sky is boiling. And often they do appear just before a severe thunderstorm. The name mammatus comes from the Latin mamma for udder or breast, characterized by the cloud’s rounded and lumpy formations. Pilots know to avoid cloud formations like mammatus because of the strong turbulence they can impart on a plane. The Latin word aurora means “morning light.” The stunningly beautiful light show can best be seen near the Earth’s Artic and Antarctic regions. In the north, they are called northern lights (aurora borealis) and in the south they are called southern lights (aurora australis). These naturally occuring lights are created when the Earth’s magnetic field interacts with solar winds. The resulting ionization process emits colorful light swirls and patterns. Go to Death Valley National Park and you will see the famous sailing stones. They appear to have been pushed along the desert floor by an invisible hand. A long track can be seen trailing behind the stone. In fact, the stones have been moved over time by wind pushing the stone on thin sheets of ice. The trails are not always in a straight line, depending on freeze and thaw patterns over time. Interested in exploring more wonders of nature and travel? Check out the 13 reasons to make India your next vacation destination. Asperitas clouds were given official recognition as a cloud type in 2009 by the Cloud Appreciation Society and added to the International Cloud Atlas in 2017. The name refers to the “roughness” of the cloud’s texture in the sky. They often appear ominous but are rarely a precursor to storms. You will find these cloud formations most commonly in the Great Plains region of the U.S.
Turquoise ice can be found at Lake Baikal in southern Siberia. The lake is the largest freshwater lake in the world. It is also one of the clearest lakes in the world. Each winter, the ice that forms on the lake takes on a beautiful turquoise hue. Large chunks of ice, formed from massive ice floes, jut up from the surface and catch the suns rays like blue/green jewels. As unlikely as it may sound, lightning can sometimes be seen within the outflow of a volcanic ash cloud or plume. Studies show that static charges can occur within the plume from the collision of ash, rock and ice particles. The lightning occurs within the eruption by a process called charge separation. The Starling is a very social bird. You’ll most likely find them in flocks of hundreds or even thousands at a time—called a mumuration. When preparing to roost, a murmuration can be seen flowing and diving through the air in what seems like a choreographed dance. Starlings are also great mimics. They have been known to imitate other birds as well as random man-made noises. Turbulent wind combined with intense rising heat can generate a dramatic vortex of flame that is called a fire devil. The spinning eddies of wind and smoke draw up burning debris and combustible gasses, allowing the flames to draw higher. The fire devil can grow quite tall. Examples from wildfires have been estimated to be up to 50 meters tall. The world’s largest salt flat, Salar de Uyuni, is located in southwest Bolivia in South America. Formed from prehistoric lakes, the salt crust is extremely and consistently flat across its surface. During the rainy season the Salar exhibits a stunning mirror-like quality. The placid pool of water spread evenly across the salt flat and undesturbed by wind reflects perfectly the sky above it. The illusion of the seemingly endless horizon makes for fantastic photographic opportunities. Interested in exploring more wonders of nature and travel? Check out the best bucket list ideas to live life fully. Also, check out Hidden Treasures: 15 most valuable attic, wall, and garage sale finds.